Steve Hill and his wife Gwen Parmelee Hill purchased the first parcel of their Parmelee-Hill Vineyards property in 1994 and planted it with Syrah. In subsequent years Steve and Gwen purchased adjoining acreage, piecing together what is today the 65 acre Parmelee-Hill Vineyard. Steve had known the property well, as a portion was once part of the celebrated Durell Ranch, although had never before been planted. 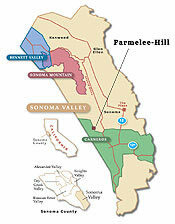 Parmelee-Hill Vineyards lies in the Southwest corner of the Sonoma Valley and Sonoma Coast Appellations, a stones throw from the Carneros line. 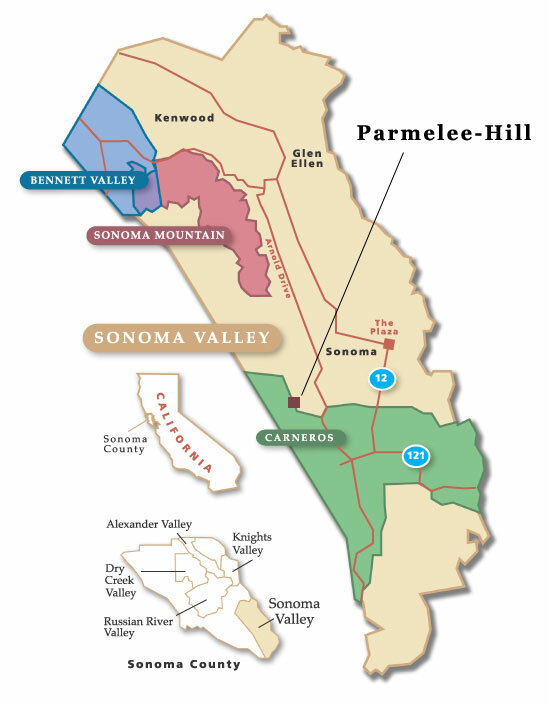 The heart of the Parmelee-Hill property sits on a knoll that faces the Sonoma Valley to the East and San Pablo Bay to the South. The climate is typical of coastal influenced areas. Morning fog retreats during warming midday hours. The warmth is commonly broken however by intense afternoon ocean winds that quickly drop the temperature. The fog sometimes retreats only as far as the Western hills until it blows back overhead fairly early in the afternoon. This type of climate tends to be self-restricting, resulting in naturally low-yielding vines producing fruit with intense flavor. The unique Parmelee-Hill site allows the propagation of Syrah and Zinfandel on southwest and eastern facing slopes and Pinot Noir, Chardonnay, and Roussanne on the exposed rock and clay flats. Grapes from Parmelee-Hill Vineyards are sold to such notable wineries as Armida, Orin Swift, Patz and Hall, Asti, Natural Selections, Glen Lyon, Three Sticks and Steele. Many of these wineries make a vineyard designate from the ranch. Click map for a larger image. Steve's experience comes from growing the world renowned Durell Vineyards grapes for over 35 years since their planting in 1979. What is believed to be the first Vineyard Designate Syrah in Sonoma County was produced by Kendall Jackson and Edmunds St. John in the 1980’s from grapes grown by Steve next door on the Durell Ranch. Steve and Ned keep an eye on every little detail, farming for world-class quality. The wines made from their grapes are the result of their constant commitment to grape growing excellence.